Summary: The Fitbit Charge 2 Is as advanced as a fitness tracker can get without morphing into a full smart-watch. 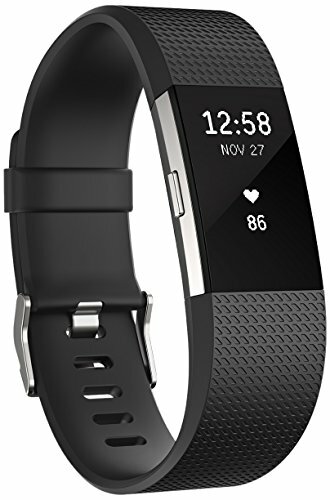 This model includes connected GPS, Bluetooth connectivity to phone apps, and the slim good looks on which Fitbit built their name. There are plenty of advanced features too. Comments from buyers are very positive. People who are aspiring to get fit found this model useful – as well as dedicated fitness fans. You can check out that feedback, and see close-up pictures of this tracker in action, over on this dedicated amazon.co.uk product page. Many clones exist out there, though their spec is limited compared to the Charge 2. When you put these bracelets on, you’ll notice the styling difference too. For me, original Fitbits just look that much more stylish than those copies. You can switch bands (leather, sports and others are available). You can also pick from a range of colours. Black and ‘Gunmetal’ (dark grey) are popular, though pink, white, plum and the blue / green ‘teal’ options are available. There are also two sizes. 5.5 to 6.7 inches is the small, while 6.7 to 8.1 is the large. Straps are adjustable, though don’t forget to leave a little room so that the tracker is not too tight against your skin. What Makes the FitBit Charge 2 Different from an Ordinary Fitness Tracker? Continuous heart-rate monitoring is the newest addition. This unlocks a lot of features. The Charge 2 also has the ability to connect with your phone’s GPS, multi-sport tracking and insights into your sleep. If you are a runner, this FitBit can now map your course, show how fast you went and supply heart-rate details. This gives you all the benefits of a ‘premium’ running watch like those from Garmin, at a fraction of the price. Running is not the only sport covered. Specifics like weight training, yoga and more are tracked. With always-on heart-rate data, you’ll see how your calories get burned all day, as well as during sports / exercise. Of course, your distance travelled (via a simple pedometer / step counter) and calories burned are at the core of what the FitBit Charge 2 offers. All FitBit activity trackers come with 4+ days battery life on each charge. You can use Bluetooth to synch your band with any Android or Apple Phone. This will save your data and allow you to visualise it too. You can use the Fitbit Health and Fitness App for this – or one of many alternatives. The Fitbit app is designed to work with the Charge 2. You’ll find graphics covering your activity, calories burned, and details of that all-important sleep cycle. One big advantage of the Fitbit app, is that you can link up with Fitbit owning friends. That helps to keep you accountable, and to set group challenges too. At the time of writing, 80% of the feedback was 5 stars or 4. Some people did question the accuracy, with one reviewer angry that his 20 steps to the garage and back were not included! I hope he resolved his issue (which was probably with the settings). Most other people were complimentary. A theme that ran through the positive reviews was that these are a great motivator to keep fit. That reminder function when you stay still too long, plus the ability to see your improvements are both popular features. You can read the comments yourself – and check out the answer to that important question of whether you should shave your wrists or not (warning, gorilla joke follows!) on the dedicated amazon.co.uk product page. Wrapping Up: Can’t Decide Between a Simple Tracker and Premium Running Watch? Fitbit Charge 2 Is the Answer! These fitness trackers tick all the right boxes. They look great, are slim compared to those bulky GPS watches, and are packed full of features. Continual optical heart rate monitoring might sound minor, though this unlocks a lot of potential. Not only can you track many types of sporting activity, you’ll get valuable insights into your sleep too. Check out this dedicated amazon.co.uk product page for yourself now and see those close-up pics and detailed spec!